The bittersweet irony is Big Sugar uses a process called "pre-harvest burning" to make its fortune. 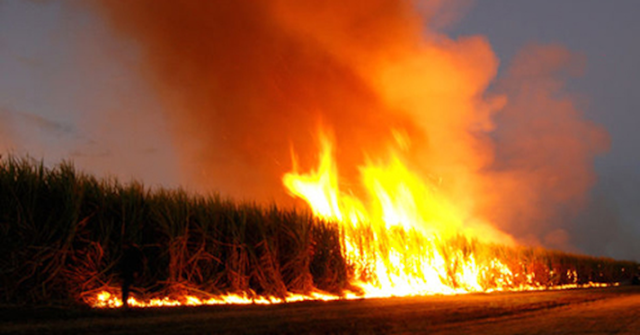 From October to April or May, the companies ignite huge fires in their fields to burn off so-called "trash," the outer leaves of the cane stalks, before harvesting. Steve Messam, 35, one of the activists and an associate pastor at Glades Covenant Community Church in South Bay, was born in Belle Glade. He grew up taking his heavy breathing and allergy flare-ups for granted. Many neighbors and schoolmates had the same symptoms. When he went to college in Michigan, his respiratory ailments disappeared. But when he returned for Christmas each year, his ailments also returned. Today, his wife and 4-year-old son have similar problems. His son uses a breathing machine during the burn season. "There’s nothing like opening your door and being greeted by ash rushing into your home and over your body or going outside and seeing your car covered with it," he said. "I have to pressure clean my doors and porch at least once a year." His home air conditioner filters should last three months or more, but he changes them monthly during the burn season. Teachers such as Mariya Feldman share Scott’s experiences and outrage. Feldman, who has a master’s degree in environmental science, taught for two years in Pahokee, which is surrounded by cane fields and has a sugar refinery nearby. She said most of her students showed symptoms of asthma during burn season. Feldman visited the U. S. Department of Agriculture in Palm Beach County on two consecutive days for answers, but no one was available to speak with her. She emailed sugarcane officials, but no one granted her an interview. She complained to the fire department. An official promised to "look into it." She called the Sheriff’s Office and was dismissed as being "naive" for accusing Big Sugar of harming the environment, she said. When I was told Chris King, a Democratic candidate for governor, would visit Belle Glade to meet local activists who are trying to persuade sugarcane farmers to change their pre-harvesting method, I wondered why he would invite the ire of the powerful industry. Belle Glade, south of Lake Okeechobee, is one of Florida’s poorest towns. Agricultural and conservative, it has a population of roughly 19,000. Only about 10 percent is white, and the median household income is $26,859. Running a serious campaign for governor requires millions of dollars. King, a 39-year-old Harvard-educated Democrat and business owner, will not find much money in Belle Glade and in two other nearby towns, South Bay and Pahokee, together nicknamed The Muck. "I traveled to Belle Glade," King said, "because I wanted to better understand the communities that live there, the challenges they face from sugarcane burning and why few leaders in our state have tried to understand this issue and figure out if there’s a better way forward. For seven to eight months a year, and six to seven days a week, this community is on fire. I came away astonished, incredibly concerned and angry." He is referring to pre-harvest burning, Big Sugar’s method of igniting huge fires in their fields to burn off so-called "trash," the outer leaves of the cane stalks, before harvesting. Activists want growers to switch to "green harvesting," using machines and human labor instead of fire. "Before my visit, I was aware that this was one of Florida’s areas of greatest poverty and shameful treatment, but I don’t think that prepared me for what I saw there," King said. "I’ve done charitable work in countries experiencing dire poverty across the world, but I never expected to view similar conditions in Palm Beach County. It unnerved me that in a county with tremendous wealth and resources, that prosperity has not been shared with the people who are helping to generate it." Most news outlets that cover the area focus on environmental problems such as water levels in Lake Okeechobee and algae blooms in once-pristine waterways flowing east and west. King said he wanted to know more after hearing about human health problems that are rarely addressed objectively. "I learned that sugarcane burning has had real public health consequences for the families that live around the lake," King said. "Residents shared with me generations of concerns about respiratory illness, asthma and associated health problems from the air quality. I also learned they live in the one community in Florida where it snows seven months of the year thanks to the ash from sugarcane burning." From October to April or May, pre-harvest burning sends up billows of toxic smoke and stench that come down over four counties. Local residents call the falling ash from the process "black snow." Since King will not grab many voters in The Muck, I asked him to explain what he hoped to gain from the visit. He said few politicians acknowledge the "extraordinary poverty" in the area, and even fewer have the courage to take on Big Sugar, the industry that has created some of the very conditions residents face. "What’s happening in Belle Glade is at the intersection of race, poverty and environmental neglect and justice, and our state has turned a blind eye to the public health and economic impacts of sugar cane burning," he said. "Since my visit, I’ve asked myself why, and it’s because one industry, sugar, has a vise grip on Florida politics." If elected, he said he would make "substantial efforts" to get the Florida Department of Environmental Protection to conduct research and publish the findings on the public health effects of sugarcane burning on communities around Lake Okeechobee. "The issue in Belle Glade and other communities around the lake is that the sugar industry has told us that if we begin using green technologies and innovation on pre-harvest burning, which are proven to be better for people, we will hurt the economy. I reject that premise and false choice." In this column, Democratic gubernatorial candidate Chris King got a lot of things right about how sugarcane burning negatively impacts the Glades communities with one enormous caveat: The outdated, toxic and unjust practice of pre-harvest sugar field burning in and around the Everglades Agricultural Area should be stopped rather than studied. No one in the Glades should continue to experience the six to eight months of smoke and ash, the already well-documented threats to public health, the cost of clean-up or the limitations burning puts on the local economy, while the practice is studied. It is time to apply the rules for eastern Palm Beach County residents (no burning when the wind blows toward eastern Palm Beach County) to everyone (no burning when the wind blows in any direction). That means stop burning, period. We know there is an alternative to burning because Florida’s sugar producers already use "green harvesting" when it is convenient for them. We also know green harvesting is used by the world’s largest sugarcane producers. Studying the practice in Florida would just kick the resolution can down the road and prolong the ill effects of sugar field burning on some of the state’s most vulnerable citizens. If you want to study something, then study how much valuable vegetative material has gone up in smoke every year that could have otherwise been used to create jobs in the Glades and even more profit for sugar producers. Be a good neighbor, Big Sugar, and stop blowing smoke.